On July 3, 2015, Khusnuma Begum and Md. 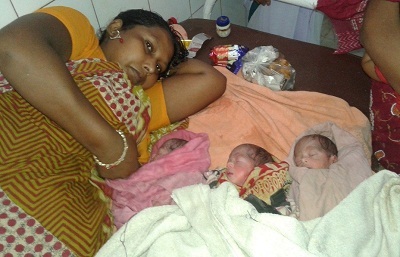 Adil of Satal Nihalbhag Nagar Panchayat of Bahadurganj Block in Kishanganj District, are blessed with a triplet in Bahadurganj Public Health Center (PHC). Bahadurganj is one of the areas, where AMANAT Karyakram (Mobile Nurse Mentoring Team) intervention, as part of skill strengthening process, is going on under the Bihar Technical Support Programme. The nurses who were on duty during the delivery successfully handled the different stages of labour and initial management of the newborns. All the three babies had low birth weights which were around 1570 gms. Amongst the three, one was a baby girl and the other two were boys. The babies along with the mother were released from the facility after 20 hours. After the discharge, the CARE Team kept track of the babies and the family, visiting them seven times in the first month and five times in the second month along with government frontline workers. At the time of discharge, the mother was asked to provide special attention to her babies because of the low birth weight. The Auxillary Nurse and Midwife (ANM) at the facility demonstrated skin to skin care for providing warmth to the babies and maintaining a steady temperature. The mother and other family members participated in this demonstration. Moreover, counselling on breastfeeding, dry cord care, delayed bathing and minimum handling were other advice were given at the time of discharge. During a home visit to the family, we came to know that the mother had complaints about feeding her babies, and relatives were putting pressure to give cow’s milk to supplement the feed.The CARE Team along with the ANM and ASHA identified those relatives and sat with them separately to convince them that ‘Mother’s milk is the best’. The ANM separately demonstrated to the mother about the correct ways of breast feeding. After one week, the babies also had fever. The family was counselled to take the babies to Bahadurganj PHC. Doctor in the PHC gave medicines and told the mother to feed the babies more and more breast milk. The babies also faced Diarrhoea in the first month, but got treated through a pediatrician in the district hospital. Currently, the mother is looking healthy and is now doing normal household work. Triplets are fine as well, and are also gaining weight. They are even responding to voices and are beginning to develop their listening skills. Triplets are nearly 15 times more likely to die than a singletons within one month of birth, but fortunately, due to the combined interventions, we could manage to save all three of them. Field team at Kishanganj, every month, is tracking all the babies identified with low birth weight along with frontline workers of the government health system, and directly contributing towards reduction of neo-natal mortality rates, in a district where infant mortality rate is fifth highest in Bihar.